We left Putney Bridge at midday on Sunday, headed out down Garrett Lane, through Earlsfield and Tooting towards Croydon. The weather was fair but we were riding straight into a headwind which was challenging with a heavily laden bike and not being very aerodynamic. At the pre-departure weigh in Pierre was riding 62kg and John 54kg. We made good progress throughout the day cycling nearly 40 miles. Just as the first rain drops fell we spotted a campsite and near Wrotham Heath and pitched our tents in a downpour. We tried to reason with Mr Campsite to allow us to make a fire for our braai and he eventually caved in and said we could do whatever we wanted. But in that torrential rain a fire just wasn’t possible. So we went to the pub up the road for dinner. The rain came down all night and in the morning we packed up camp in the pouring rain. Everything was muddy and soaked – great start. It was great to have a bunch of close friends on the bridge to wave us goodbye. Tears of joy were well masked by the styling and awesomeness of the Fitzgerald and Lewis sunglasses from Bailey Nelson. So amped for you both. Passop vir die vinged griep !! Go big brother. You a star. Will be following you. 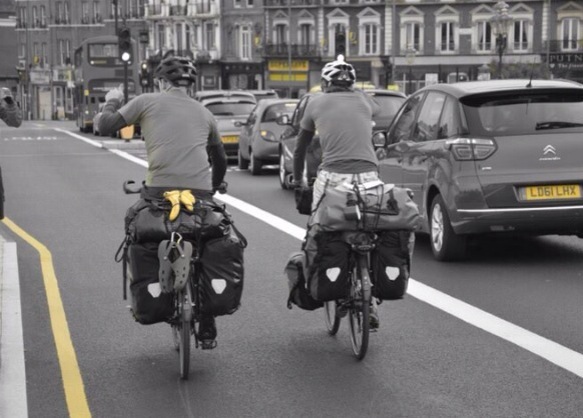 Looking forward to seeing many pictures and stories of your epic journey! Best of luck! Trap boys trap! Have an amazing journey! Good Luck and God Speed my boytjie!! Thanks Sally, yep I think you right, already have some good ideas of shedding some weight. Keep in touch. Thanks Nick, nice to hear from you. Thanks Marius, that’s kind of you. Good to hear from you. We will keep in touch. Your blogs are great – stay safe and enjoy your wonderful adventure – thanks so much for sharing with us all!